Alzheimer’s disease is now estimated to affect one in two persons over the age of eighty and is being diagnosed in people as young as fifty. For the many people now trying to cope with a loved one suffering from this tragic disease, this collection will provide solace and valuable insight for family members as well as for those in the medical community who work with anyone afflicted with Alzheimer’s disease. 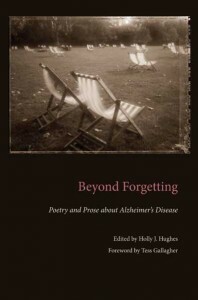 Beyond Forgetting is a unique collection of poetry and short prose about Alzheimer’s disease written by 100 contemporary writers—doctors, nurses, social workers, hospice workers, daughters, sons, wives, and husbands—whose lives have been touched by the disease. Through the transformative power of poetry, their words enable the reader to move “beyond forgetting,” beyond the stereotypical portrayal of Alzheimer’s disease to honor and affirm the dignity of those afflicted. With a moving foreword by poet Tess Gallagher, this anthology forms a richly textured literary portrait encompassing the full range of the experience of caring for someone with Alzheimer’s disease. EditorHolly J. Hughes’s chapbook Boxing the Compass was published in 2007, and her poems and essays have appeared in a number of literary journals and anthologies, including Dancing with Joy: 99 Poems. A graduate of the MFA program at Pacific Lutheran University, she teaches writing at Edmonds Community College in Washington, where she codirects the Convergence Writers Series. Click here to watch The Bath online or to download.